Use at the sign of infestation or for general pest control. Applying this product in calm weather when rain is not predicted for the next 24 hours will help to ensure that wind or rain does not blow or wash pesticide off the treatment area. See the COMPLETE LABEL for timing of application specific to particular species of pests. This product is labeled for the control of numerous species, with specific rates, instructions and precautions per species. See the COMPLETE LABEL for specific use rates, mixing instructions and detailed instructions. Concentrated Indoor/Outdoor Insecticide formulation mixes readily with water and other aqueous carriers. 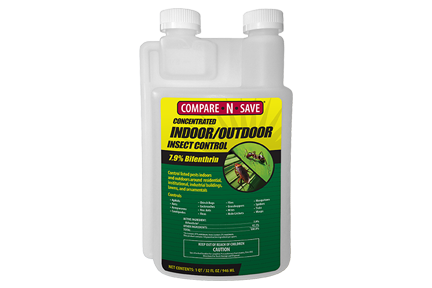 Use Concentrated Indoor/Outdoor Insecticide as a tank mix with other pesticides, including insect growth regulators. If applying as a tank mix, all precautions and limitations on each separate product label must be followed. For use in food/feed-handling establishments, as general surface application, outdoors and as spot, crack and crevice application, consult label for specific instructions. Indoor: In the home, all food processing surfaces and utensils should be covered during treatment or thoroughly washed before use. Exposed food should be covered or removed. For residual control of the listed pests in buildings, structures and on modes of transport, apply as a crack and crevice, pinstream, spot, coarse, low-pressure spray (25 psi or less) or with a paint brush. Do not use as a space spray or as a broadcast application to interior surfaces of homes. Apply to areas where pests hide, paying special attention to cracks and crevices. Apply to baseboards, corners, storage areas, closets, around water pipes, doors and windows, in attics and eaves, behind and under refrigerators, cabinets, sinks, furnaces, stoves, under shelves, drawers and similar areas. Cockroaches, crickets, firebrats, scorpions, silverfish, spiders and ticks: Apply as a coarse, low-pressure spray to areas where these pests hide. Boxelder bugs, centipedes, earwigs, beetles, millipedes, pillbugs and sowbugs: Apply around doors and windows and other places where these pests may be found or where they may enter premises. Also spray baseboards and storage areas. Rate: Dilute 0.5–1.0 fl. oz. in one gallon of water. Apply one gallon of dilution per 1,000 sq. ft. Apply to trails, around doors and windows and other places where ants may be found. Rate: Dilute 1.0 fl. oz. in one gallon of water. Locate and treat ant nests where possible. Apply where ants have been seen or would be expected to look for food. Higher dilutions and/or volumes may be required when treating concrete surfaces. Apply the dilution to the soil where the firewood will be stacked at the rate of one gallon per 8 sq. ft. DO NOT treat the firewood directly. This pesticide is extremely toxic to fish and aquatic invertebrates. To protect the environment, do not allow pesticide to enter or run off into storm drains, drainage ditches, gutters or surface waters. Applying this product in calm weather when rain is not predicted for the next 24 hours will help to ensure that wind or rain does not blow or wash pesticide off the treatment area. Rinsing application equipment over the treated area will help avoid runoff to water bodies or drainage systems. Care should be used when spraying to avoid fish and reptile pets in/around ornamental ponds. This product is highly toxic to bees exposed to direct treatment or residues on blooming crops or weeds. Do not apply this product or allow to drift to blooming crops if bees are visiting the treatment area.